Republic Day was celebrated with gaiety and fervour across the state yesterday. Governor Urmila Singh unfurled the National Flag and took the salute. Student artists of the Lawrence School, Sanawar, brought alive the pre-independence period when the freedom struggle movement was at its zenith. The cancellation of the Youth Congress elections in the state and the decision to debar Vikramaditya, son of Union Minister for Micro, Small and Medium Industries Virbhadra Singh, from contesting fresh elections has stirred the state Congress politics. The Tibetan parliament-in-exile has written to Chinese President Hu Jintao, urging him to intervene and stop the alleged atrocities against Tibetans in Tibet. Sleuths of the State Vigilance and Anti-Corruption Bureau caught an inspector, Surestha Thakur, posted as station house officer (SHO) at Jogindernagar red-handed yesterday after she allegedly accepted Rs 40,000 as a bribe from the complainant to settle a case in his favour. 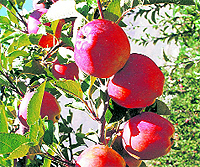 Anticipating a big demand for apple plants from growers in view of a good spell of rain and snow this winter, the Horticulture Department has raised 45 lakh saplings in its nurseries besides importing “plant materials” from the USA, Canada and Switzerland under the Apple Rejuvenation Programme. Himachal Pradesh Congress Committee (HPCC) chief Kaul Singh Thakur today demanded a White Paper on the grave financial position of the state. Shimla, January 27 Seeking cooperation and adoption of a rationale view on the issue of enhancement of fee and other examination charges by Himachal Pradesh University, Vice-Chancellor ADN Bajpai today said a hike was imperative as the cost of all inputs had gone up since the inception of the university in 1970. Dr SD Kashyap, Dean, College of Forestry, Dr YS Parmar University of Horticulture and Forestry, has brought laurels to the university and the state by being nominated for two national-level and one state-level committees. Ajeet Bajaj, an alumnus of the 165-year-old Lawrence School, Sanawar, has done his school proud by bagging the Padma Shri in the sports category for exemplary performance in skiing. The school staff is elated at this achievement as it is a rare honour. Headmaster Praveen Vasisht, while terming it as a proud moment for the school, said it would serve as an inspiration for students. Vijay Sharma, a famous art painter of Chamba, was given a rousing reception by people of Chamba for the conferment of the Padma Shri on him on his arrival at the local Bachat Bhawan this evening. The National Bank for Agriculture and Rural Development (NABARD) has sanctioned Rs 16.51 crore as loan under its Rural Infrastructure Development Fund (RIDF) scheme to the state for nine road projects. The roads will be constructed by the PWD in Shimla, Kullu, Kangra, Solan and Hamirpur districts. This is the fifth sanction for the state during 2011-12 under Tranche XVII of the RIDF. The cumulative sanctions now aggregate Rs 382.21 crore during 2011-12. Republic Day was celebrated with gaiety and fervour across the state yesterday. Governor Urmila Singh unfurled the National Flag and took the salute during a march past at the state-level Republic Day function held on the historic Ridge Maidan, here yesterday. Chief Minister PK Dhumal, Congress Legislature party (CLP) leader Vidya Stokes, HP Congress Committee chief Kaul Singh Thakur, local MLA Suresh Bhardwaj and other dignitaries were among those present on the occasion. An impressive march past was presented by contingents of the police, the ITBP, the Home Guards, the Army, the SSB, the NCC, the NSS and ex-servicemen. The tableaux exhibited by various departments were the main highlights of the function. Cultural programmes were presented by troupes from within and outside the state. HAMIRPUR: IPH Minister Ravinder Ravi unfurled the National Flag during a glittering ceremony at Sujanpur to celebrate Republic Day yesterday. Ravi took the salute from marching contingents of the police, the Home Guards and student troupes. The minister paid tributes to freedom fighters and nation builders. He said the state appointed 19,251 teachers during the present regime and process to recruit 5,000 more teachers is on, besides appointing 800 doctors and other staff. A cultural programme was also presented on the occasion. Later, the minister also distributed prizes among students and others who excelled in various fields. SOLAN: Transport, Town Country Planning and Urban Development Minister Mahender Singh Thakur unfurled the national flag at the Thodo Ground on the occasion of the district-level Republic Day function and took the salute during a march past by contingents of the police, the Home Guards and the NCC. Earlier, he paid floral tributes to martyrs at the war memorial at Chambaghat. Later, while addressing the gathering, he said four important towns in the state had been identified for launching the Rajeev Awas Yojna so as to ensure comprehensive development of these towns. In order to achieve the same, a detailed planning of these towns, along with their adjoining areas, was being conducted so that best urban facilities could be made available. CHAMBA: Republic Day was celebrated with enthusiasm and gaiety at the historic Chowgan of Chamba yesterday. Himachal Pradesh Vidhan Sabha Speaker Tulsi Ram unfurled the national flag and took the salute during a march past presented by contingents of the police, the Home Guards and the NCC. Speaking on the occasion, the Speaker said Rs 39.29 crore was spent on various welfare schemes during the past four years in the district for the uplift and wellbeing of the weaker sections of society. MLAs BK Chauhan and Kuldeep Singh Pathania, former minister Mohan Lal, BJP district president Bhupinder Chauhan, zila parishad chairperson Santosh Thakur and Chamba Deputy Commissioner Sharabh Negi were among others who were present. KULLU: The 63rd Republic Day was celebrated with fervour at the Dhalpur Maidan here yesterday. A large number of people participated in the celebrations in their traditional costumes. Horticulture Minister Narender Bragta took the salute from contingents of the police, the ITBP, the Home Guards and the NCC (Army wing) led by the Himachal Home Guards Band. MLA Govind Singh Thakur, chairperson of Himachal Pradesh Women Commission Ambika Sood, representatives of the panchayati raj bodies, the DC and other district officials were among those present. BILASPUR: The state is spending Rs 120 crore on subsidising rations. This was said by Food and Civil Supplies and Consumers Affairs Minister Ramesh Dhawala after unfurling the National Flag at the district-level Republic Day function after taking salute from contingents of the police, the Home Guards, the NCC and the Naval NCC here yesterday. Student artists of the Lawrence School, Sanawar, brought alive the pre-independence period when the freedom struggle movement was at its zenith during the staging of a momentous Hindi play “Remember the Legends” at the Tagore Theatre, Chandigarh, on Republic Day. The audience was submerged in patriotic fervour as the songs like “Sarfaroshi Ki Tamanna”, “Mera Rang De Basanti Chola” and touching dialogues with brilliance and drollery wafted across the hall. 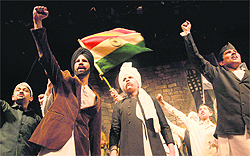 The play depicted the chronology of movements and events, including the difference of opinion and approach, among top leaders during their crusade to achieve the common goal of independence. Designed and directed by Sidharth Shasta, an alumnus of FTTI, Pune, and a film actor, the magnum opus with over 150 prodigious artists on stage could well be termed as a director’s play. With deep insight into the saga of courage, conviction and supreme sacrifice of true patriots like Bhagat Singh, Sukhdev, Rajguru and Chandra Shekhar Azad, besides many more who went unsung. Sidharth used audio visual screen effects and clippings to recreate the real ambience. The elaborate sets, both symbolic and functional with instantaneous shifts facilitated the acting spells while the spirited festive folk dances and songs build a contrast to heighten the impact of tragic scenes. The dances for situations were choreographed by Satbir Singh, while Piyush Mitra and Deendyal penned the dialogues. All artists, especially Shivam, who were too young for the ideological and conceptual grasp of the volatility of martyrs put up a wonderful show of talent and training. Justice Rajive Bhalla, an old Sanawarian, who was the chief guest on the occasion, complimented the student artists and the staff of the school. Sources told The Tribune that after the decision of the Foundation of Advanced Management of Elections (FAME), the body that conducted the poll, regarding the cancellation of the Youth Congress elections and debarring Vikramaditya from re-contesting was made public, instructions were issued to loyalists of Virbhadra Singh in the state Youth Congress to put down their papers as a mark of protest. However, the diktat did not receive much support. But for a few block-level Youth Congress leaders, there was no major defection in the Youth Congress. The sources said Youth Congress leaders took advice from their respective Congress leaders and MLAs. The MLAs advised the Youth Congress leaders not to go against the decision of Rahul Gandhi. Senior Congress leaders from the state, including Virbhadra Singh loyalists, also did not come out openly against the FAME decision. In Kangra, the politically most significant district of state, former MP and HPCC general secretary Chander Kumar was the only leader to openly flay the decision of FAME to debar Vikramaditya from re-contesting the Youth Congress elections. Chander Kumar termed the decision of FAME as injustice towards Vikramaditya. FAME should have at least given Vikramaditya a chance to present his version regarding the allegations levelled against him. Even the Election Commission gave a chance to contesting candidates before taking any action against them. The Congress was trying to rope in the youth, but this decision of FAME would discourage the youth from joining the party, he said. Another senior Congress leader and confidant of Virbhadra Singh, said on condition of anonymity that they would hold a meeting in Delhi before finalising their strategy to tackle the situation arising out of the FAME decision. The strict action taken against Vikramaditya has silenced other aspirants for the post of state Youth Congress president. There were some celebrations after the FAME decision at the residence of Raghubir Singh Bali, son of prominent Congress leader from the state GS Bali, who was at the runners-up position in the cancelled Youth Congress elections. However, the celebrations were immediately cancelled. Raghubir Singh Bali limited his statement over the development by saying that the decision taken by FAME should be accepted by all. It illustrated that the election process of the Youth Congress was strictly as per the norms fixed by Rahul Gandhi, he said. Former state Youth Congress president Manmohan Katoch, who performed badly in the cancelled elections, also declined to comment on the situation emerging out of the FAME decision. Katoch said he would re-contest the elections. It has also urged the international community to intervene and send fact-finding missions to Tibet for assessing the situation arising out of increasing incidents of self-immolation by monks there. The Tibetan parliament-in-exile, in an open letter that was also released to the media, said despite China’s claim of having created a paradise on earth in Tibet in the past 52 years, there was growing frustration among Tibetans against the Chinese policies and programmes. Since last year, 17 Tibetans have set themselves ablaze, of which 12 succumbed to their injuries. The status of the five others was still unknown, the letter said. It said when China was celebrating Chinese New Year on January 23, the police indiscriminately fired upon peaceful Tibetan demonstrators in Drakgo, Serta and Zamthang, resulting in several deaths. The Tibetan parliament-in-exile said China’s assimilation policy coupled with mass migration of Han Chinese into Tibet in the past 52 years had turned the Tibetans into a minority community in their own country. Extraction of Tibet’s mineral resources was affecting Tibet’s fragile ecology. The benefits of the so-called economic development had not percolated down to the Tibetans, resulting in economic marginalisation of the Tibetans, the Tibetan parliament-in-exile has alleged. It has also urged the Chinese president to withdraw the large reinforcement of military in Tibet to reduce tension and take measures to give due consideration to the aspirations of the Tibetan people. The accused was today produced before Varinder Singh, special sessions judge, Mandi, who sent her to a two-day remand. After she was arrested, the police has put her under suspension as she was deemed as suspended as she was in custody for two hours. Acting on a complaint lodged with the Vigilance Bureau against the inspector, the joint vigilance team led by the DSP, SIU, Shimla, Rajinder Sharma zeroed in on the spot under Jogindernagar police station and caught Sureshtha red-handed. The team recovered Rs 40,000 from her and arrested her under Sections 7 and 13/2 of the Prevention of Corruption Act yesterday. According to vigilance sources, there are many complaints against the SHO. She had allegedly demanded Rs 1 lakh from the complainant for not lodging an FIR in a case against him. SP Vigilance, central range, Virender Sharma told The Tribune that they received a complaint from Nand Lal of Chadi Nihar Kalan village in Ladbharol in the district, who is a constable in the BSF, RS Pura, Jammu and Kashmir. She had demanded money in lieu of settling of a complaint given in the Jogindernagar police station against his son, Ashok Kumar, who is also serving as a constable in the BSF at Ferozepur (Punjab). He added that further investigation was on in the case. Meanwhile, Mandi ASP HS Thakur said she had been put under suspension after the police received a report from the Vigilance today. Under the Rs 85-crore Apple Rejuvenation Programme launched last year, not much success could be achieved due to a prolonged dry spell in the winter. With a good spell of rain and snow this winter, the demand for planting new apple plants is expected to be pretty high, for which the department has made arrangements. “We have over 45 lakh saplings in our nurseries and private registered nurseries to meet the demand of the growers, who will prefer better and high-yielding varieties,” said Narender Bragta, Horticulture Minister. He added that though the demand already placed before the department stood at 14 lakh, it was likely to shoot up after the recent spell of rain and snow. He said besides the saplings in the nurseries, about 46,000 “plant materials” of apple, cherry and pear were likely to arrive in February from the USA, Switzerland and Canada. “This year our target is to cover 1,500 hectares of land with high-yielding and better varieties so that the growers get better returns from their orchards,” he said. The Apple Rejuvenation Programme was launched by the state government with much fanfare to be able to replace the ageing trees with better varieties. The scheme, spread over a period of five years, proved to be a non-starter due to the unusually dry spell last winter, thus bringing about negligible results. To ensure that only bacteria and virus-free plants were planted by the growers, the department is also keeping a check on “plant materials” being brought from outside the state. There have been instances where plants infested with bacteria have been brought by the growers from Jammu and Kashmir and Uttarakhand. Addressing a press conference here today, the state Congress chief said not only were development works suffering on this account, but allowances worth Rs 1,200 crore due to the employees were yet to be paid. “The poor financial health of the state definitely warrants issuance of a White Paper as the government has now shown any prudence in its fiscal management even as the debt burden has risen phenomenally,” he said. He said it was for this very reason that the Chief Minister did not make any announcement regarding payment of dues to the employees, who were expecting to get it on Republic Day. Kaul Singh said the BJP regime had failed on all fronts and its tenure was marked by one scam after another whether it involved the land, forest or liquor mafia. “The Congress demands that a CBI inquiry should be held into the purchase of substandard foodgrains under the PDS and a high-level inquiry into land purchase by HIMUDA at a much higher rate in the Dharampur area of Solan,” he said. He said shortly the Congress would hold public meetings in all 68 Assembly constituencies to make people aware about the “anti-people decisions” of the BJP regime, misuse of government money and to counter the false propaganda by the BJP regime on discrimination by the UPA government against Himachal. The HPCC chief said the Congress charge sheet against the Dhumal regime would be ready before March 31 and would be handed over to the President, with a demand for a CBI inquiry into all charges contained in it. He said the committee headed by BBL Butail, constituted to look into the reasons for the party’s defeat in the Renuka bypoll, would be submitted to him within a week as the team had visited the area and taken feedback from party workers. Seeking cooperation and adoption of a rationale view on the issue of enhancement of fee and other examination charges by Himachal Pradesh University, Vice-Chancellor ADN Bajpai today said a hike was imperative as the cost of all inputs had gone up since the inception of the university in 1970. Bajpai today chaired a meeting to discuss the recommendations of the Resource Mobilisation Committee for the rationalisation of the fee structure in the HPU. The meeting was attended by teachers, employees, students and representatives of the ABVP, the SFI and the NSUI. Bajpai, while seeking the cooperation of the students and the teachers, tried to dispel apprehensions about a big hike in the fee structure by the university. His versatile 30-year research experience in different aspects of agro-forestry, which includes national and international experience, has earned him a selection by the Director-General, ICAR, as member of the Research Advisory Committee of the National Research Centre for Agro-forestry (NRCA), Jhansi, for three years from January 2012 to 2015. He will thus help in providing strategic vision for devising future strategies in agro-forestry in 27 All-India Coordinated Research Projects spread across the country besides the Jhansi-based NRCA. Dr Kashyap has also been nominated to the Research Policy Committee of the Dehradun-based Indian Council for Forestry Research and Education which helps accord priority to various research projects across the country. He has also been nominated in the working group assigned the task of formulating the 12th Five-Year Plan for the state Forest Department. VC KR Dhiman while congratulating Dr Kashyap said his versatile experience would benefit the agro-forestry sector. Ajeet Bajaj, an alumnus of the 165-year-old Lawrence School, Sanawar, has done his school proud by bagging the Padma Shri in the sports category for exemplary performance in skiing. The school staff is elated at this achievement as it is a rare honour. Headmaster Praveen Vasisht, while terming it as a proud moment for the school, said it would serve as an inspiration for students. He said the all-round development of a child, which their school ensures, had helped Ajeet develop a love for adventure sports thus inspiring him to adopt this as a career. He joined the school in 1975 and passed out in 1983 and was an active trekker from his school days. At the age of 12, he had climbed the 12,000 foot (3,700 m) Friendship Peak, near Kullu, and then at the age of 16 years, he ascended the Hanuman Tibbal, a 20,000 foot (6,100 m) peak. Ajeet, who is an explorer and the first Asian to have rafted and kayaked some of the most challenging and turbulent rivers of the world spanning six continents has over 25 years of experience in adventure sports. He is not only the first Indian to have completed the polar trilogy by skiing to the North Pole, South Pole and across Greenland, but in April 2006, Ajeet also became the first Indian to have skied to the North Pole and the first to ski to both the North and South Poles. Ajeet proudly unfurled the Indian flag at the Geographical South Pole on the Indian Republic Day, 2007. Before being nominated for this fourth highest civilian award, he had won a bronze medal in the national games for kayaking and one silver and two bronze medals in international rafting competitions in Switzerland, Siberia and Russia. Ajeet became the first Indian to ski to the Geographical North Pole on April, 26, 2006. He is also one of the few people to have skied to both ends of the planet. Enduring temperatures that went below -70°C, crossing 50 foot ridges of ice and crevasses, open icy water leads, shifting polar ice, tackling blizzards and wind speeds exceeding 60 km per hour, he faced some of the most extreme conditions. A grand function was organised jointly by the Chamba chapter of the Indian National Trust for Art and Cultural Heritage (INTACH), the Society for Promotion of Indian Classical Music And Culture Among Youth (SPICMACAY) and Sewa Himalaya, an NGO, which was attended by a huge gathering of the Chamba region from all walks of life. Deputy Commissioner of Chamba Sharabh Negi was also present. The Deputy Commissioner said by being conferred the Padma Shri, Vijay Sharma had brough laurels for Chamba. Speakers highlighted Vijay Sharma’s works of art and said the Padma Shri was the outcome of his longtime dedication to the field of painting. Vijay Sharma attributed his success to the blessings of the Almighty.